PROPOSED NEW CONSTRUCTION It's easy to call the beautiful Bryce floor plan your home. 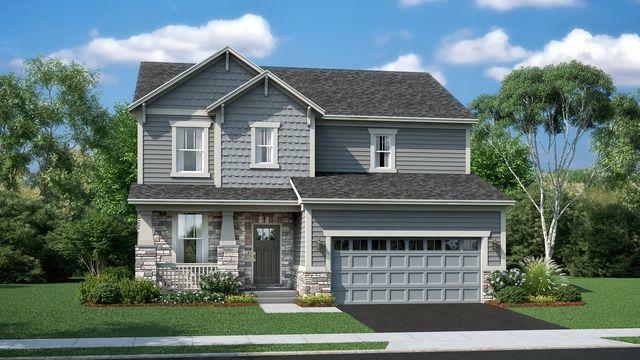 This gorgeous home features three bedrooms, two-and-a-half bathrooms, a two-car garage and a basement. The foyer leads to the flex room and family room. The family room is the heart of the home designed to be the perfect space for entertaining guests and opens to the expansive kitchen and breakfast area. The modern kitchen features a large center-island with breakfast bar, breakfast dining area, your choice of Aristokraft cabinetry and new Whirlpool appliances, as well as a walk-in pantry and family foyer leading to the garage. Settle into the comfort of your living space on the second floor with three bedrooms, a loft and two full bathrooms. The laundry room is also conveniently located upstairs and features an optional sink. The exquisite owner's suite features a private bathroom with double bowl vanity, oversized walk-in shower with seat and an expansive walk-in closet.